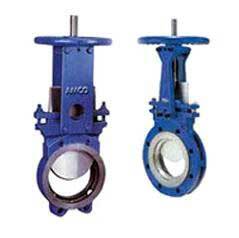 We are engaged in offering the clients Knife Edge Gate Valves, which are used for different industrial purposes. We manufacture high quality Knife Edge Gate Valves using the latest technology. These Knife Edge Gate Valves undergo several quality control measures to make them devoid of all defects. The Knife Edge Gate Valves can be obtained by clients at reasonable pricing. Oring Material : Embedded 304 SS Ring, EPDM, Neopran, Silicon, etc.